Waylon wins the coveted Capt. Jay Joiner Belt Buckle! 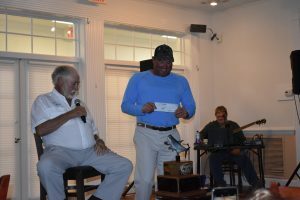 Some of the country’s most famous tarpon guides packed the Rotonda Golf & Country Club on the evening of Saturday, July 7 to watch Capt. Waylon Mills be presented with the Jay Joiner Captain’s Award of 2018. He took the honor by recording the most releases out of four popular annual tournaments – the Ladies’ Day Tarpon Tournament, the World’s Richest Tarpon Tournament, Ladies Howl at the Moon Tarpon Tournament and the Red Gill Invitational. This year Waylon had 18 releases in those four tournaments. Capt. Mills also took the Jay Joiner Memorial Belt Buckle in two other tournaments, one in 1999 and one in 2010. The award was presented by President Cappy Joiner of the Boca Grande Fishing Guides Association.